Freshman Shane Bowers backhanded home his own rebound with 41 seconds left in overtime to lift #2 BU to a 3-2 win over #14 Quinnipiac at High Point Solutions Arena. The Terriers had responded twice to one-goal deficits to force overtime with both scores coming from sophomore Patrick Harper. The Bobcats produced the only first-period goal when Alex Whelan fired from the right circle and beat Jake Oettinger high to the stick side. BU matched that tally with a power play goal early in the second as Harper converted a loose puck from just outside the crease, assisted by junior Bobo Carpenter and sophomore Chad Krys. Ten minutes later Quinnipiac regained the lead on Bo Pieper’s snipe from the high slot, but just 53 seconds into the third period, BU knotted the score again. Freshman David Farrance sent the puck ahead to Harper, who split the QU defense and fired a shot from the left circle that bounced of goalie Keith Petruzzelli into the net. 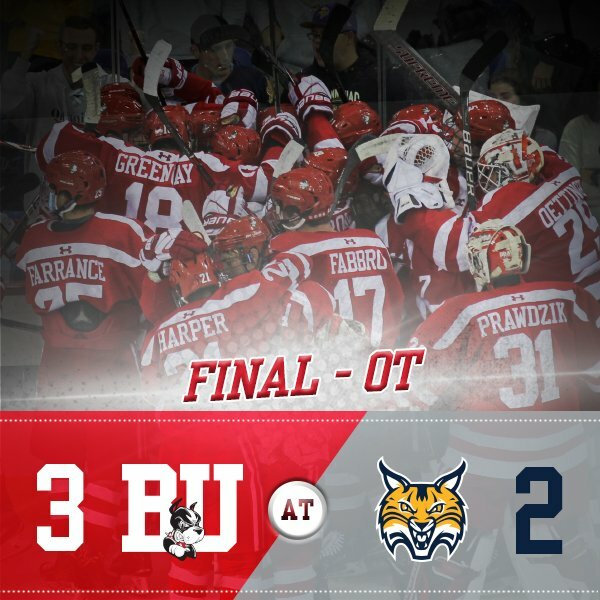 BU dominated the third period, outshooting the Bobcats, 7-3, but the score remained deadlocked. While Quinnipiac had the upper hand early in overtime, it was the Terriers' second line that produced the game-winner—and again Harper was the catalyst. From behind the QU net, he skated along the right boards and across the top of the circle before sliding a pass to Bowers in the slot. Petruzzelli stopped the initial shot, but with Brady Tkachuk creating chaos near the crease, the center from Halifax, Nova Scotia jabbed the rebound into the net to produce a hard-fought win for the Terriers. Oettinger turned aside 22 Bobcat shots, including 10 of 11 in the second period, while keeping Quinnipiac off the scoresheet for the final 30 minutes of play. 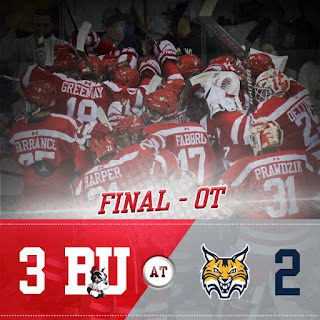 Carpenter, who led BU with seven shots, was strong in the faceoff circle, winning 20 of 23 draws.